Pegasus II is preparing for our 2nd launch attempt in a several weeks. It is difficult to express the magnitude of the project, which is the contribution of 47 volunteers, and takes users on a real-time trip to 100,000 feet in the upper atmosphere. The following is a concise summary of the flight, craft configurations, and Operational Technology used during the flight. [Figure 1] shows the flight events over time. It takes 1 hour and 41 minutes to reach the target altitude goal of 100,000 feet. It takes less than 12 minutes for the craft to descend 94,000 feet at which point the life saving main parachute is deployed. After the main is deployed is slightly over 6 minutes to touchdown. Configuration at Launch and Touchdown. 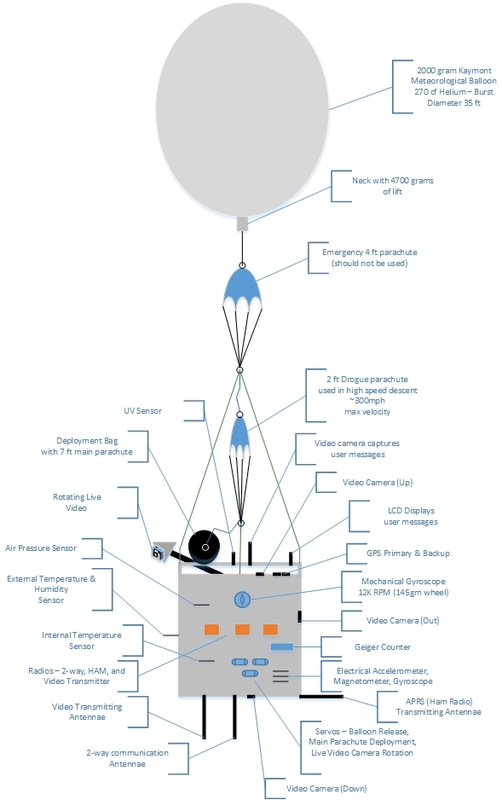 The launch configuration [Figure 2] details the complexity of the craft, with its sensors, radios, and servos. This visualization tells the story why flight command was unwilling to risk the craft on the previous launch attempt without the system in perfect working order at launch. We cannot have a “glitch” on the flight line prior to launch, otherwise we are risking thousands of man hours and 10s of thousands invested in the craft…and that is not going to happen. 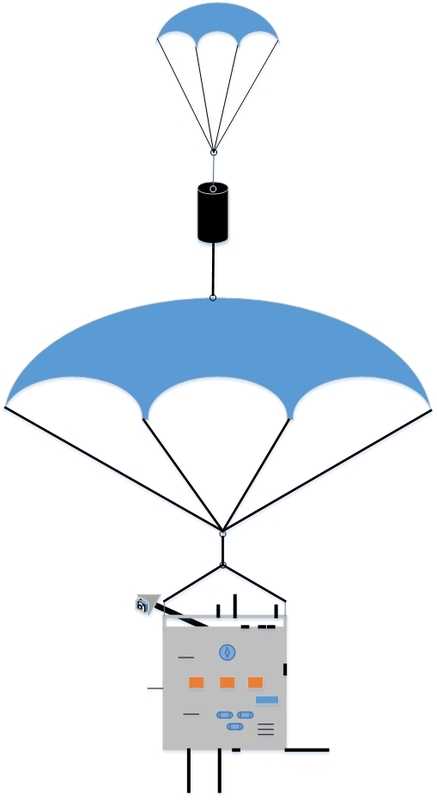 The touchdown configuration [Figure 3] shows how the craft appears after main parachute deployment. 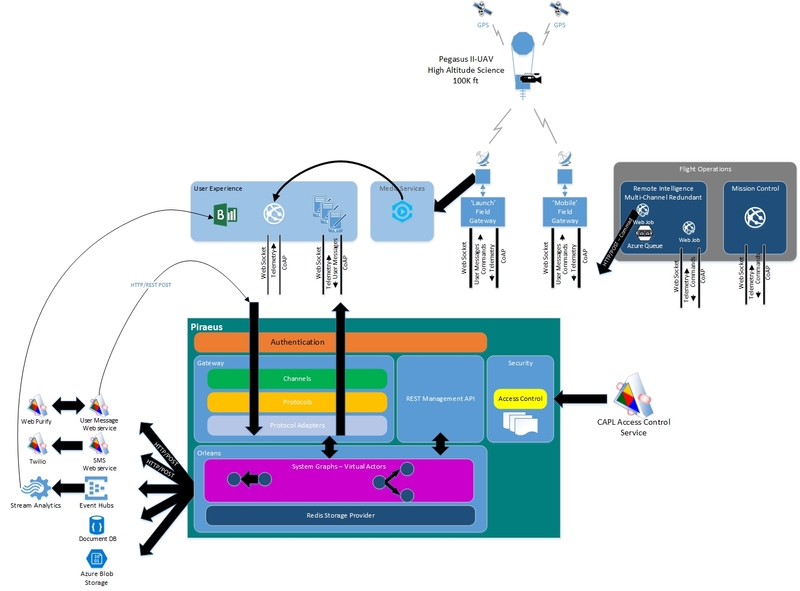 The Operational Technology that drives the user experience as well as flight operations is shown in [Figure 4]. The graphic complex, but at its center is Piraeus and MS Research’s Orleans. What is interesting is the all the work by our mission team on the technology is performed through interfacing with Piraeus/Orleans, not customizing it. That means that the most critical part of the real-time communications is simple, to leverage, because it provides the communications layer in the context needed by the applications to use it. We have also included some latency tests in [Figure 5] on the Operational Technology, which resides in Microsoft Azure in the West Coast Data Center. The latency, in milliseconds, were conducted using telemetry and a round trip from a single VM in Data Center to the Operational Technology in the West Coast. The latency from one point to another is approximately one half of the latency of the round trip. What you will also notice is the latency over distance changes, but it does not dramatically change. Our rock star phone teams have also provided apps for iOS, Android, and Windows using CoAP protocol over Web sockets, which we believe may be one of the first experiences delivered in the manner. Our Web site team has provided an experience that mashes up several real-time aspects of telemetry broadcast, mapping of the chase vehicle, launch station, and inflight craft as well as live video streams from the launch point and the flight as it flies. Operational Technology Tested (Piraeus/Orleans) Tested is located in Microsoft Azure West Coast Data Center. Data Center is table is the client testing a round trip to the Operational Technology and back to the client.